At 1.7 kilometers in length, the high-speed ice track is one of the longest and fastest bob runs anywhere – and the only natural ice track in the world. The world’s best athletes regularly battle for World Cup points. And European and World championships and two Olympic competitions have been decided on the legendary bob track since way back. And now it’s your turn: icerunner events offers you and your guests the exclusive experience to race down the Olympic Bob Run yourself. As a pilot in the Monobob. 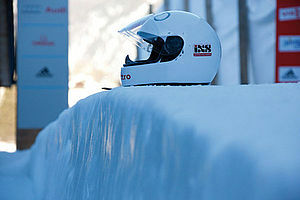 You and the ice track: St. Moritz is waiting for you! 10 World Championship medals, 3 European Championship medals, 11 Swiss Championship titles and two bronze medals at the Olympic Games in 2002 at Salt Lake City and in 2006 at Turin. 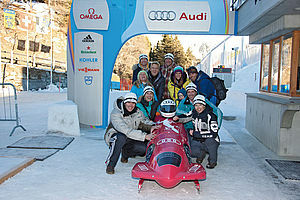 In addition, the skeleton professional has also celebrated successes as a bob racer at St. Moritz: Swiss Vice Champion, category B. As you can see, your guests will be able to enjoy their solo runs down the ice track with excellent preparation. Superbly guided and looked after by the best athletes and professionals. Ice and snow in St. Moritz feel different from anywhere else. For many reasons: a fairytale setting, the sunshine, the exclusive atmosphere, dream hotels, culinary highlights, the Olympic Bob Run and so much more. Without question, we offer you and your guests at St. Moritz a supporting program matching the thrills of the solo descents in the ice track. 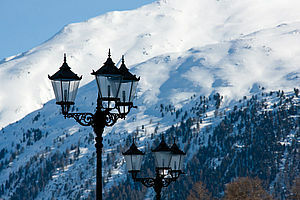 And we will make sure that you get to know St. Moritz from its best side! An event and a program set around ice and snow. In one of the most breathtaking landscapes of the world. In the midst of soaring mountains, lakes and glaciers. Even the most exacting guests will be astonished. The less demanding all the more.